I’ve experienced some of the best and worst treadmills (as well as everything in between) throughout my many years of working out. When I came across the Proform ZT10 Treadmill, I felt overwhelmed with joy. Here, at Gym Blazer, we like to keep things as honest as possible. After carrying out in-depth research into the ZT10 treadmill, I quickly came to the realization that it’s one of the best treadmill’s I’ve come across so far. I couldn’t help but be blown away by the incline features, folding design, top speed, and workout programs available. All the features come together and provide users with an incredible experience that will boost your weight loss and fitness goals. There are many reasons why the Proform ZT10 Treadmill is considered to be high-end. We’re about to take a deep dive into the amazing features that this treadmill has to offer. One of the biggest beneficial features that struck me was the sheer amount of workout programs available. There are 32 built-in workout programs to choose from. Having a wide variety of different workout options available is a huge plus. It means you won’t be getting bored of the same old workouts, which can become incredibly tedious on a treadmill! Choosing between the workout programs is also super easy with the simple control panel. Once you select a program, the ZT10 Treadmill automatically adjusts the speed and incline for you. You can feel assured the workout programs are effective for keeping you fit as they were created by certified personal trainers. Using this Proform Treadmill to workout from home is as easy and convenient as ever. This is due to the SpaceSave design. You can simply fold up the frame of the treadmill and move it to a better place for storage where it’s out of the way. You may be concerned about the weight and how you would go about trying to fold it up and move it around. Well, the Easy Lift Assist feature takes care of most of the hard work for you. So, if you live in a smaller space, you can just fold it up and store it in a better place. Personally, a treadmill that comes equipped with incline settings is a must for me. And I know this is the case for many other people too. 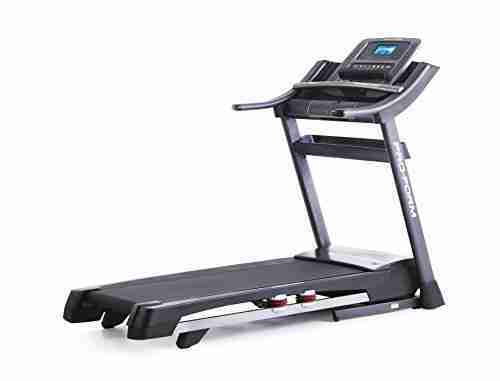 Therefore, you’ll be glad to hear that ZT10 Proform Treadmill does have incline features. You have the option to increase your treadmill to an incline of 15%. What’s the benefit of this? Well, simply put, running up a hill is a lot tougher than on a flat surface. As a result, you put in more effort and are able to boost your fitness and weight loss results. If you choose a certain workout program, the treadmill will take care of the incline settings for you. However, changing the incline settings manually for your own workouts is easy too with the Quick Control feature. You can increase or decrease the incline while using it so that the flow of your workouts isn’t disturbed. A major issue that I’ve been noticing among many of the treadmills available is that the deck’s are often too hard. 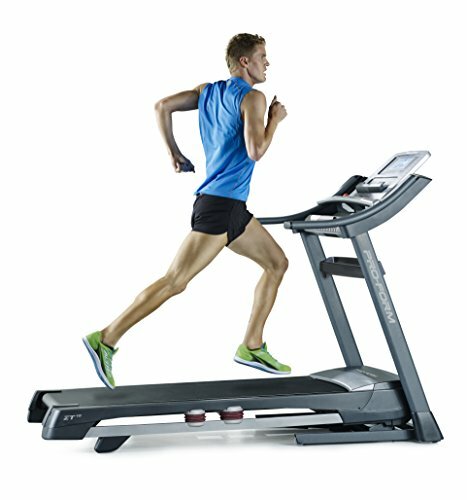 If you’re walking/jogging/running on these treadmills for extended periods of time, it begins to wear down on your joints. This leads to pain and discomfort and you aren’t able to recover as well to workout more often. Essentially, your fitness and weight loss goals will be put on hold. That’s why the ProShox Cushioning that’s built-in to the Proform ZT10 Treadmill is such a huge benefit. It works effectively to reduce the heavy impact on your joints so that you can recover better and carry on working out more often. When I’m working out on my treadmill at home, I often have to set up the treadmill and a fan nearby to stay cool. However, the ZT10 treadmill is constructed with a built-in fan for your convenience. You can alter the temperature and speed of the fan by using the Quick Control configurations. Staying cool while working out is crucial and it can be difficult when working out from home. The last thing you want to do is purchase giant fans that you see in commercial gyms. Well, with this Proform Treadmill, that doesn’t have to be a concern. 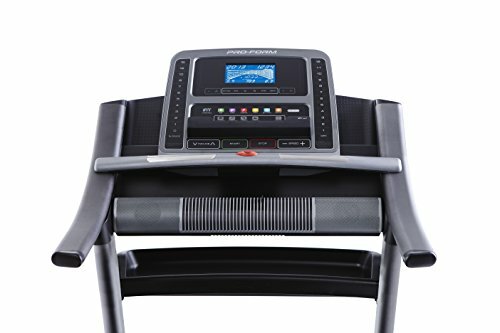 Many treadmill within this price range come with a variety of technological features to enhance your workout experience – and the ZT10 has its fair share to offer in the music department. I liked how you can easily connect your iPhone into a port. 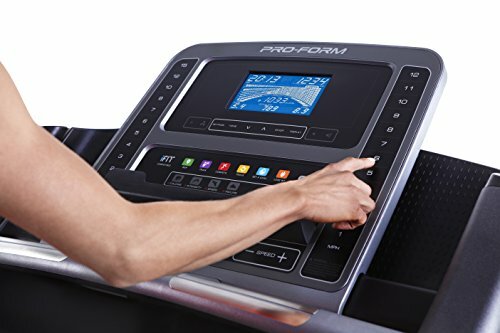 It connects to the treadmill and lets you play music through the small speakers that are built-in. There are two speakers that are just 2” in size each, so they aren’t a big distraction. I was surprised by the quality of the sound, and really that should be no shock because it’s operated by an Intermix Acoustics 2.0 Sound System. This Proform Treadmill is designed to last. Despite the fact that it’s fairly lightweight and easy to fold and transport, the frame is constructed to be extremely durable. The deck is 20” x 60” large, which is perfect for taking larger steps without feeling restricted. I appreciated how this model can take a maximum weight capacity of 350 pounds. This is a result of the sturdy frame design. Storing your belongings is very easy with the large accessory tray provided. 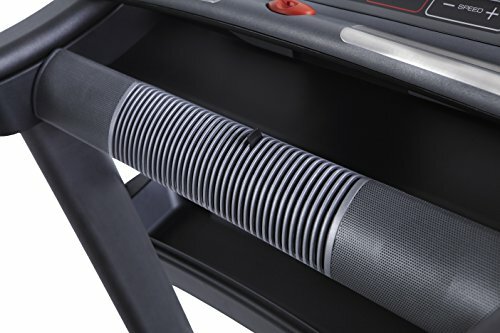 This is a simple but important part of a treadmill’s design that adds to the user’s experience. There are also big water bottle holders to ensure you remain hydrated throughout your workout. Furthermore, I can’t forget to mention that you can sprint on this treadmill with a max speed of 12 mph. So, it’s excellent for walking, jogging, AND sprinting. I love being able to see what my heart rate is while working out on a treadmill. It lets me know if I’m working hard enough to elicit the kinds of results I want, and it’s super easy with the Proform ZT10. The handlebars are equipped with sensors and all you have to do is hold on to them while working out. You’ll then see your heart rate on the LCD display. (We’ll get into that feature next…). There’s an awesome feature that lets you monitor your heart rate more accurately too. You can wear a Bluetooth chest strap and hook it up wirelessley to the treadmill for a more precise heart rate reading. Although, you do have to purchase the chest strap separately. If you are interested, I’d recommend the Polar H10 Bluetooth Heart Rate Chest Strap. Those were some pretty outstanding benefits right? 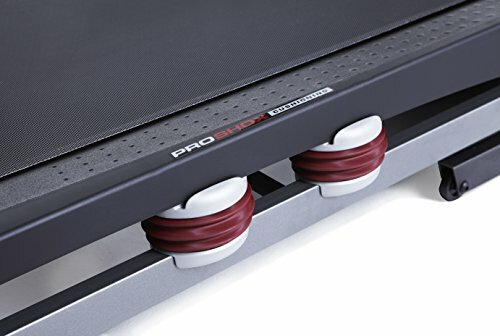 Well, before going ahead and making your purchase, I also want to quickly take you through some of the pitfalls that I found with the Proform ZT10 Treadmill. I personally found the downsides of this treadmill easy to overlook. For me, they were minor and didn’t detract a whole lot from the rest of the treadmill. Having said that some of them may be more of an issue for some than others, so it depends on your individual circumstances. The LCD display is only a minor drawback, however, I would rather be honest and tell you that I’m not a big fan of the design. It’s completely functional and lets you see all of your statistics, such as the calories burned, speed, distance, and time. This is a great way to keep track of your progress and make sure that you’re progressing. However, those are all the basic features that a treadmill should offer you. (If it doesn’t, avoid it!). So, there was nothing in particular that made the display standout. It’s pretty small and basic. I would have expected more from a treadmill of this caliber and price range. 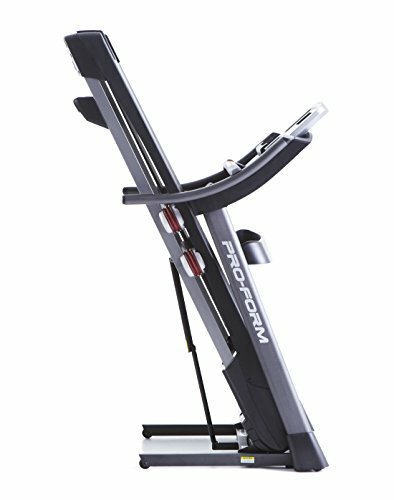 Even though it’s foldable, this Proform Treadmill is actually quite large when you’re using it. Therefore, if you have a fairly small amount of space, you may struggle a little as it can take up a lot of room. 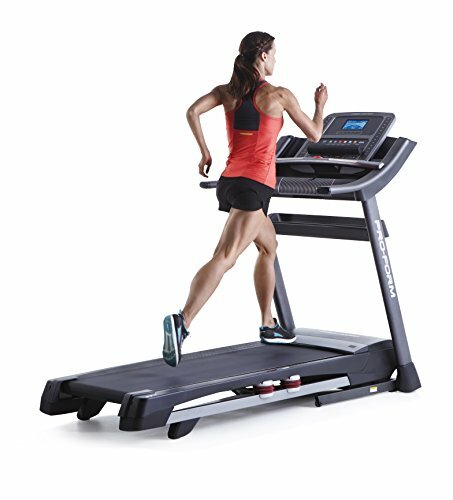 While the size of the treadmill belt (20” x 60”) is great for giving you plenty of room to workout comfortably, the rest of the treadmill is a but too bulky. The console panel is easy to use, however, it’s very large. This is a tricky one though, because the size makes the control panel incredibly easy to use while working out. But when it comes to folding and storing elsewhere, it gets in the way. There’s a wide space around the small display monitor which I feel could have been shrunk to provide a sleeker and space-efficient design. If I’m being honest, I am very impressed with this treadmill. It offers everything from over 30 workout programs and incline settings, to built-in speakers and folding features. All of these features on offer does, however, mean that you’re paying a higher price. But having said that, for a top of the range treadmill, you can pick it up at a reasonable price. You’re paying for an enhanced workout experience that will boost your results for years to come. For a peace of mind, you also get a lifetime warranty on the motor and frame – as well as a 1-year labor warranty and a 3-year parts warranty. The ZT10 Treadmill helps make working out enjoyable. The more fun you have doing it, the better chance you have of taking your fitness and weight loss goals to the next level!